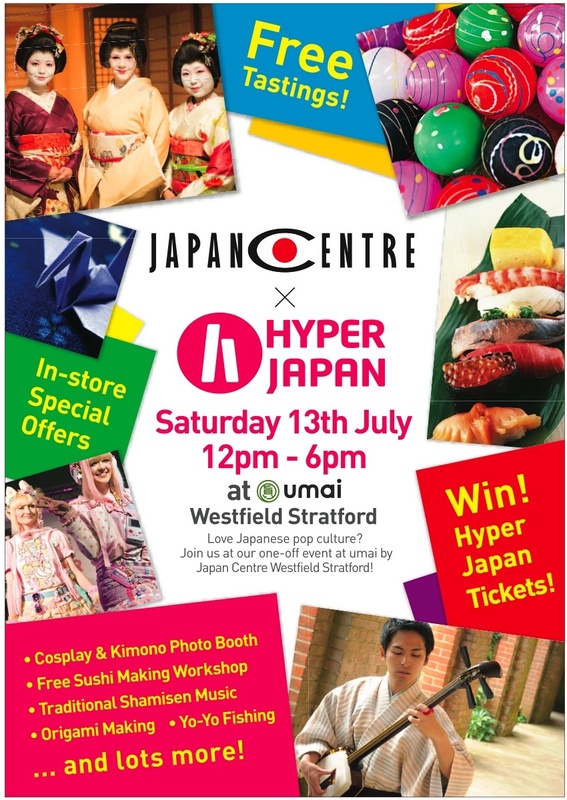 In preparation for the UK’s biggest weekend long J-Culture party Japan Centre is combining forces with Hyper Japan and holding a Japan Centre x Hyper Japan collaborative event at our Westfield Stratford store 12pm – 6pm on Saturday 13th July! You can expect some amazing activities and special offers during the day, with everything from free sushi workshops, origami making, yo-yo fishing and Cosplay photobooths; to free tastings, traditional shamisen musicians and in-store special offers. You can also be in with a chance to win a pair of Hyper Japan tickets by simply making a purchase at umai by Japan Centre that day! If you love all things Japanese, then this is a great opportunity to enjoy some unique Japanese traditions and tastes in our bustling Westfield surroundings. Why not grab some sushi or ramen from our deli while you soak up the atmosphere and contemplate your photobooth pose, or make a date with friends and come dressed in your most treasured Cosplay outfit for extra kudos! Our Japan Centre x Hyper Japan event should whet your appetite for more and tickets for Hyper Japan will be on sale at the umai counter that day. Two weeks later from Friday 26th – Sunday 28th July Hyper Japan will transform Earl’s Court London with Japanese cuisine, traditions and ‘a hadouken force punch of pop culture’, whoah! Japancentre.com will be there too of course, with snacks, manga and treats galore so make sure you stop by our booth for your hit of Melon Pan and Pocky! We have a special treat for all Japan Centre customers, get £4 off your Hyper Japan tickets by entering the code HJP2013 when you buy through this link, choosing the ‘Corporate JAPAN’ ticket option. That’s a fabulous 30% OFF! Posted in Food, Stores and tagged competition, hyper japan, Sushi Classes, Westfield, Westfield Stratford City. Bookmark the permalink.